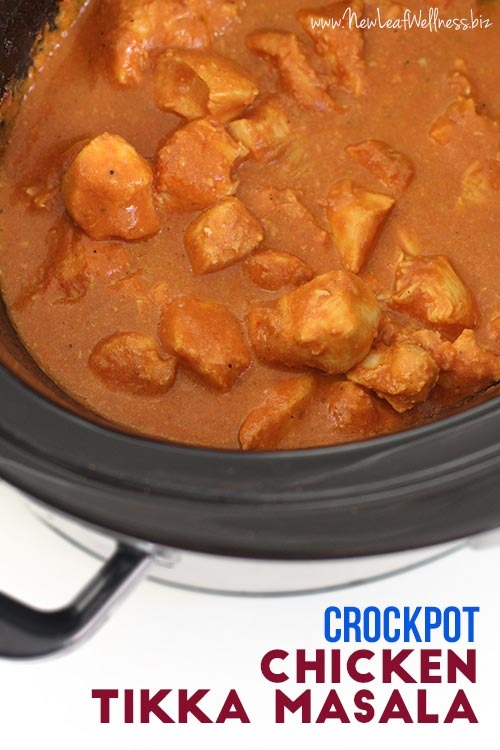 If you think crockpots are only for pot roasts, think again! 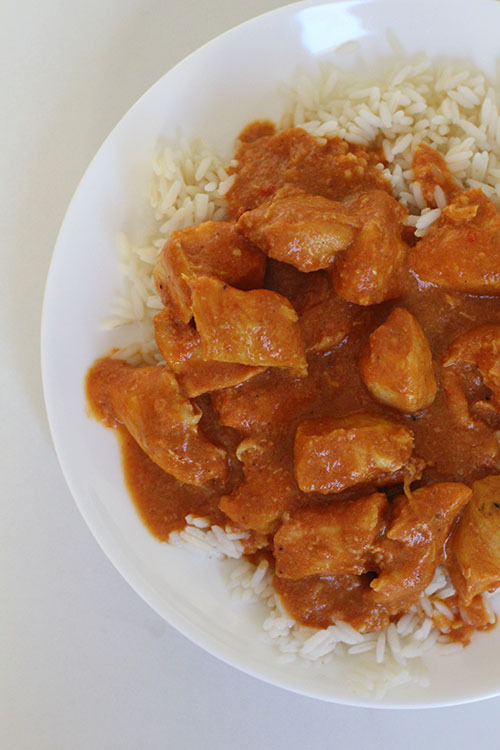 This Crockpot Chicken Tikka Masala is sweet, spicy, and sooooo easy to make! I asked the people who follow my Facebook page which recipe they wanted to see for free on my blog and this was the clear winner, so here you go. It’s sweet, spicy, and delicious. It only requires nine ingredients and most of them are staples in my kitchen. I can add it to the crockpot in the morning or freeze everything raw in a baggie for later. 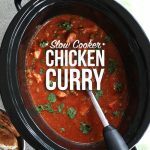 Add all ingredients to slow cooker and cook on “low” setting for 4 hours in a 6-quart slow cooker or 8 hours in a 4-quart slow cooker. To your freezer bag add all ingredients. Remove as much air as possible and seal for up to three months. 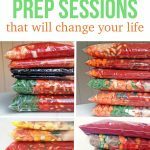 When ready to eat, thaw freezer bag overnight in refrigerator or in the morning in water. 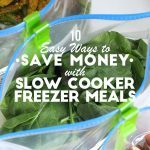 Add contents of freezer bag to slow cooker and cook on “low” setting for 4 hours in a 6-quart slow cooker or 8 hours in a 4-quart slow cooker. Serve with naan or rice and a salad. I think coconut milk will work because I used canned unsweetened coconut milk in my chicken curry recipe. Strained tomatoes will change the texture of the sauce, but you could give them a try if you don’t care about that. I did it with coconut milk tonight — and also made it in the saucepan instead of a crockpot — and it was great!! I made this with canned coconut and it was delicious! How does the cream hold up in the freezer and then slow cooker? It seems I remember some advice to add cream last to avoid curdling. We’ve eaten this recipe many times and it always turns out great. It looks exactly like the photo. I have a question about the heavy cream. Where do I find it? I was looking in our dairy aisle and saw heavy “whipping” cream and also creamer, but nothing labeled heavy cream, or is heavy whipping cream the same thing? I vouched for subbing coconut milk instead since I wasn’t sure. Thanks! Yes, I would use the heavy whipping cream. Sorry for the confusion. Making this now, smells great! 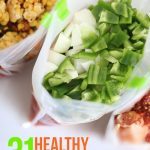 Can you freeze a cooked portion for eating later? I know I can’t REFREEZE it, but can I make it fresh then freeze leftovers? Actually wondering that about a lot of your recipes. There’s only 2 of us so that would give me some more options. Thank you!! I have a lot of meals planned out!! You can freeze any of my meals after cooking them. They’re the same as any other cooked meal. You can also cut them in half and cook in a smaller crockpot. Please just to clarify, When you say tomato sauce do you mean sauce that here in New Zealand we eat with fries and sausages etc? (It has sugar and herbs and spices etc, you might call it ketchup??) Or is it a can of puréed tomatoes? It would be more similar to a can of pureed tomatoes. I used curry paste instead of powder, and it really takes the flavors over the top. I use 3.5 T paste since we like big flavors. Also, biryani paste works great as well, it has a slightly more floral note and goes very well with chickpea curry. Either way, if you have access to curry paste, give it a whirl!